24 Oct 2005, 12:30 pm. Highpoint #37. In October 2005, Eric Stager and I made a short trip to Chicago. Of course, as soon as we started discussing our plans, I decided to fit in a side trip to the Wisconsin highpoint. Eric wasn't able to make this side trip, so when he headed back home, I picked up a car for a couple of days, and headed north into Wisconsin. The Timm's Hill trail is a 10 mile trail (one way) heading north from the Martha & Herman Rusch Preserve. The trail, groomed as a cross-country ski trail in winter, crosses the road in several places so you can make any length of hike that you like. If you wanted to travel even further, the southern end of the Timm's Hill trail connects to the Ice Age Trail. I had about a half day for this hike, so I chose to make it about a 9 mile hike, by starting at the trailhead on Hultman Road, just off County Highway C. This trailhead, which was well marked, is at coordinates N 45 deg 25.035 min W 90 deg 10.598 min, at 1475 ft. After parking the car, I started northwest along Timm's Hill Trail. This trail, marked with red blazes, was well graded, not too rocky, and easy to walk on. 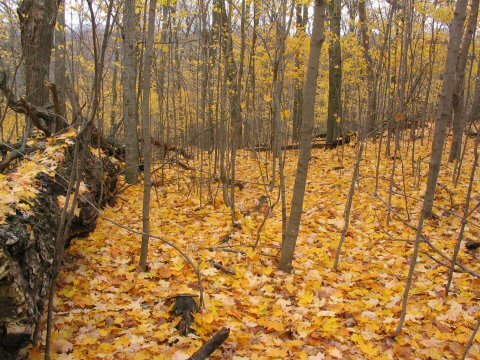 Much of it was covered by a blanket of new fallen leaves. The terrain involved lots of gentle ups and downs as the trail went along, over terrain which was formed from the moraines and debris left from the great glaciers of the last ice age. 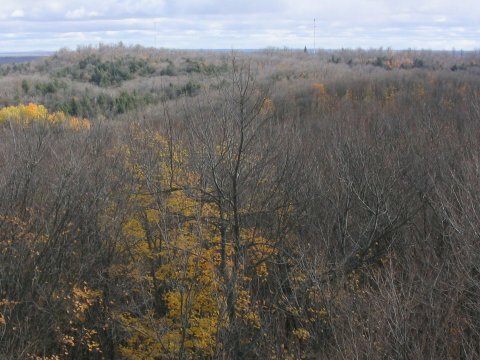 This area is part of the Wisconsin north woods. It was a couple of weeks past the peak of the fall colors, but there was still a number of colorful trees left, as well as the colorful leaves on the ground. 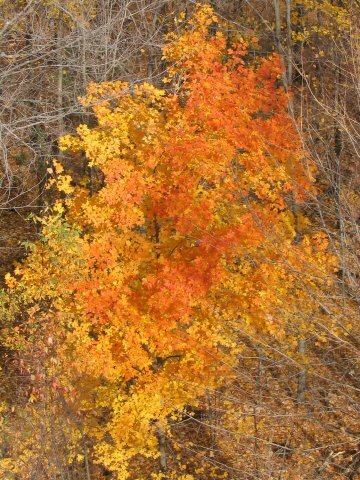 Check this link for information on the chemistry behind fall colors. 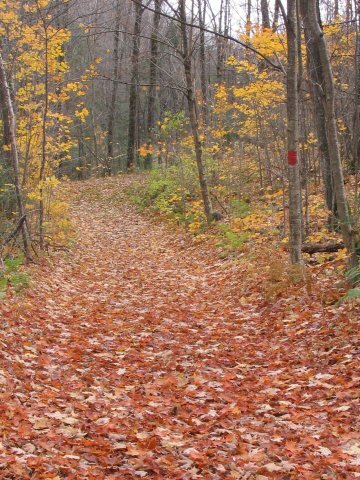 Much of the trail was covered by colorful leaves. More colors along the trails. Just before crossing Highway C, the trail passes a cemetery. 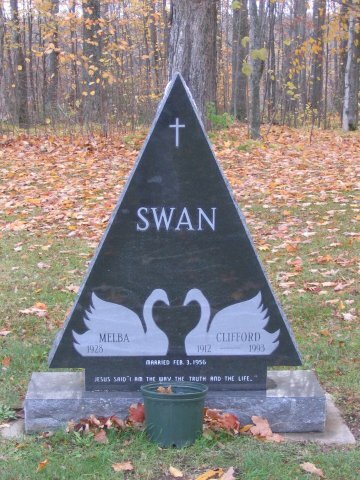 One interesting headstone, for a member of the Swan family, is shaped like a Christmas tree. 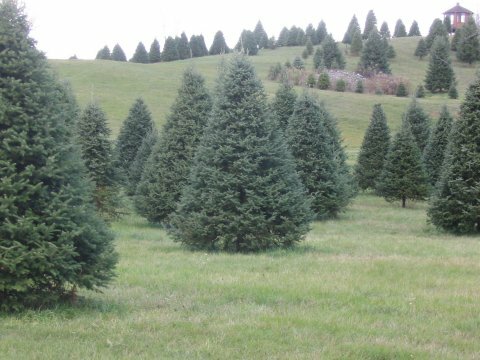 The Swan family is a long time Christmas tree grower, and some of their trees can be seen just to the west on Highway C.
The Swan family headstone, and some of their trees for sale. About a mile and a half further, a little south of Rustic Road 62, at coordinates N 45 deg 26.559 min W 90 deg 11.429 min, the trail intersected another trail, marked for horse travel. The Timm's Hill Trail continued on, to the west here, but this other trail headed in the direction of Pearson Hill, which I wanted to bag as well. Pearson Hill, at 1950.8 feet, is just 0.7 feet shorter than Timm's Hill. This is close enough to the height of Timm's Hill that it is conceivable that a future, more accurate, survey might show that Pearson Hill is actually higher than Timm's. 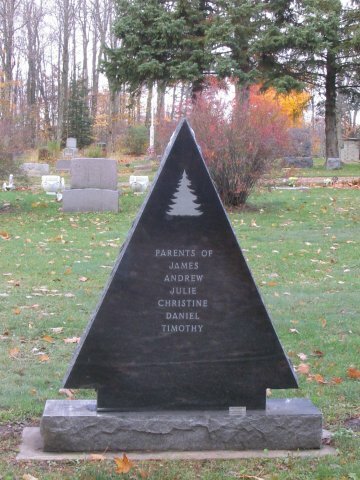 (This has happened before, before 1975 the highpoint was thought to be Rib Mountain.) To make sure that I got the true highpoint, I aimed first for Pearson. I followed the horse trail for a bit, perhaps half a mile, then headed left on another (unmarked) trail that continued in the right direction. This didn't lead straight to the summit, so soon I headed left on a indistinct, unofficial trail, that seemed to be going the right way. When this came within 100 yards or so of the summit, I headed off into the trees and bushwhacked across an assortment of fallen trees, covered by leaves, to the top, reaching it at 11:35 am. 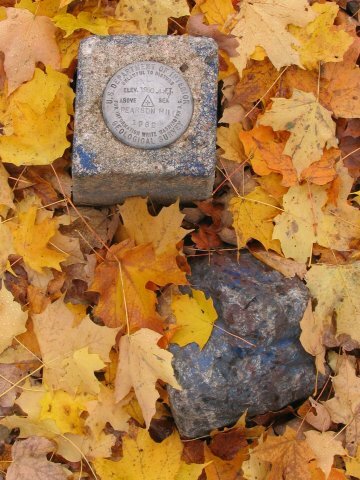 The summit, at coordinates N 45 deg 26.866 min W 90 deg 10.758 min, is marked with a USGS marker. It started to rain about this time, but all the tree cover kept me from getting very wet. USGS marker at the top of Pearson Hill. 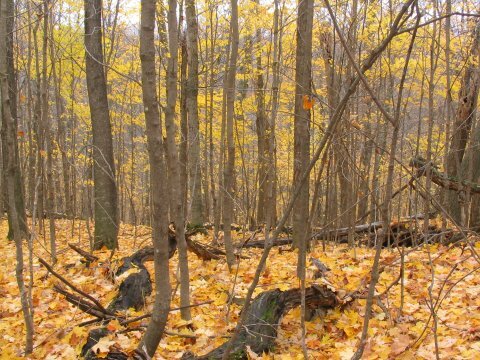 The scene at the summit of Pearson, lots of new fallen leaves in the woods. I wasn't done with Pearson yet. The best topo map that I had showed two places on Pearson above the 1940 foot contour line. The northern one (which I had just tagged), seemed like it would be the higher one, but I couldn't be sure, so I headed next for the southern point, at coordinates N 45 deg 26.605 min W 90 deg 10.900 min. Some more ski trails led me towards this point, which turned out to be on the edge of some farmland. This second point was definitely lower than the first, northern one, by about 15 feet. So, future highpointers can safely ignore this second area. After this diversion, I continued on toward Timm's Hill. I followed the horse trail back the way I had come. Soon, this intersected Rustic Road 62, and I followed the road west for a bit, passing by High Point Village as I went south of Bass Lake. 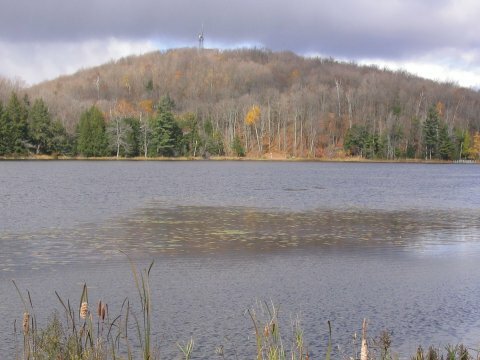 Timm's Hill, seen from south of Bass Lake. After passing the lake, I again came to the Timm's Hill Trail, and headed north on this, along the west side of Bass Lake. This trail soon joined a paved road, which wound around the lake, until it reached a small parking area. This is the trailhead for the drive-up route. From here, I continued up towards the summit and observation tower, where I claimed by 37th highpoint at 12:30 pm. 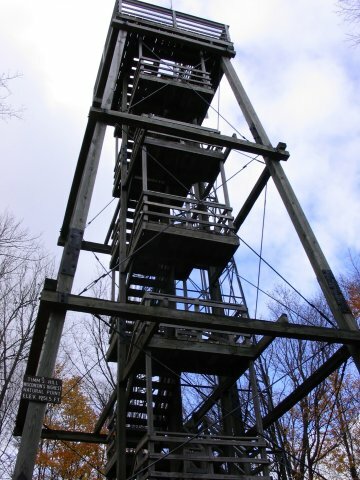 The observation tower at the top of Timm's Hill, and the view down below. Pearson Hill, seen from the tower. North is at left, south at right. 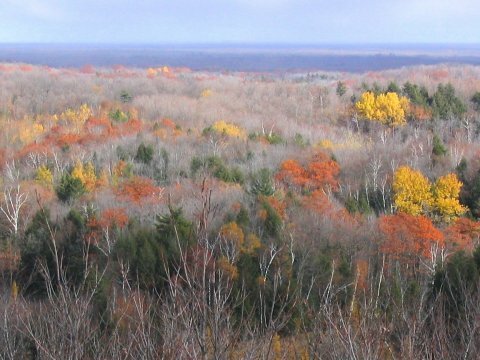 More fall colors, as seen from the observation tower. 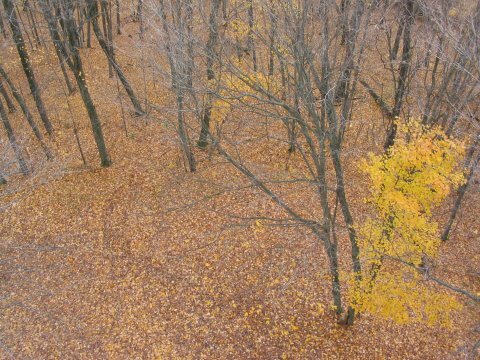 I spent around an hour checking out the view from the top of the tower, of the Wisconsin north woods all around, still decorated with some fall colors. Then, I followed the Timm's Hill Trail south, back to my car, and started the drive back to Chicago. I didn't see anybody else at all on this hike. Topo map of the area around Timms Hill. On the way to Mount Arvon, I repeated Timms Hill, along with Tom Buckley who was there for the first time. We followed basically the route I took before, except we skipped Pearson Hill. I did get confused with the naviagation a couple of times. On the way north, at the Highway to Heaven sign, there is a fork. We went left, and down the hill. A little later, the trail had another three-way intersection. We went hard right, which was a mistake, as this brought us back to the Highway, coming back on the path we did not take. Oops! Also, as the trail neared the highpoint, it disappeared as it intersected a road in the park. It was not so clear which way to go, in the end turning right and walking along the road was the correct choice, but we did not see any signs. After a quarter mile or so along this road, we came to the parking area for the normal walk-up route. Timm's Hill National Trail. National Trails System. Trail map. 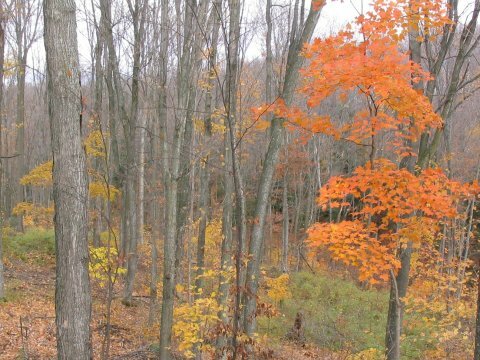 A Guide To The Ice Age National Scenic Trail. 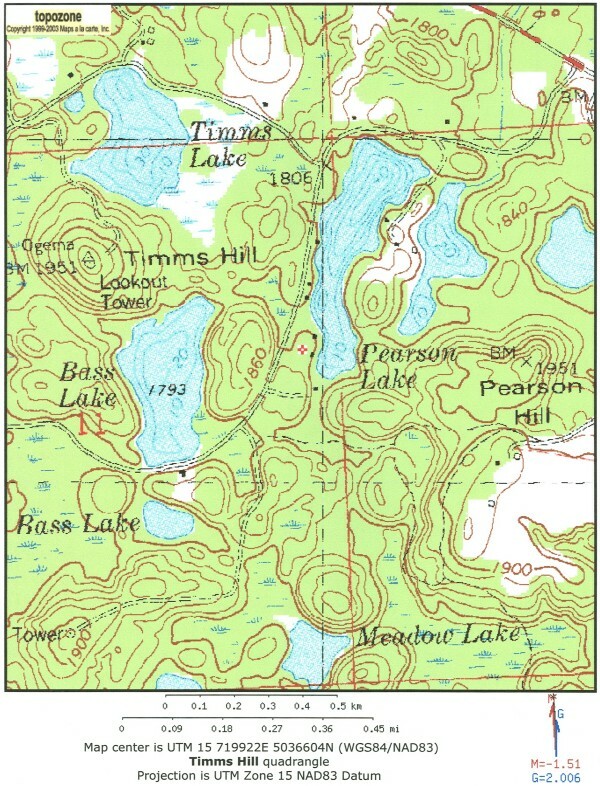 Rib Lake and Timm's Hill sections. Trail guide and map.